Plugs Into Most JVC Stereos. This harness will work on the select 2000-2009 stereos. The standard EIA colored wires will match up with the harness that plugs into your vehicle. Car Stereo Harness. Replaces factory harness for select model radios. NEW JVC RADIO CD PLAYER STEREO RECEIVER REPLACEMENT WIRING HARNESS WIRE PLUG This harness will work on the select JVC 2000-2009 stereos. These are perfect when you lost or damaged the original harness that came with your stereo or bought a used stereo without a harness. The standard EIA colored wires will match up with the harness that plugs into your vehicle. JVC KW-V330BT Stereo Receiver. DVD/CD receiver with AM/FM tuner. built-in Bluetooth for hands-free calling and audio streaming with dual phone connection. fits double-DIN dash openings. optional wireless remote. JVC KW-V330BT Stereo Receiver. DVD/CD receiver with AM/FM tuner. Bluetooth Microphone. built-in Bluetooth for hands-free calling and audio streaming with dual phone connection. fits double-DIN dash openings. JVC RM-RK258. 50 watts x 4 channels. Video Playback. Audio Playback. App Compatible. iPhone/iPod Features. Smartphone Integration. Bluetooth Connectivity. THIS IS NOT A JVC PART, LOGO, PHOTO, OR COPY. AND WAS NOT MADE BY OR FOR JVC. JVC DOES NOT AUTHORIZE THIS ITEM. WILL WORK WITH JVC AND OTHER UNITS. be for you buy this plug, be sure to look closely at your radios plug hole and my pictures to see if this plug will fit your radio. 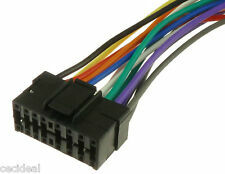 WIRE HARNESS FOR JVC KD-R99MBS KDR99MBS. HIGHEST QUALITY WIRE HARNESS. Give us a chance fix the problem. DO NOT REMOVE SECURITY LABEL, it will void the warranty. We keep records of Serial Numbers for all units we sold. Included Bluetooth adapter for hands-free calling and audio streaming. Speakers are built-in MOSFET amplifier (20 watts RMS CEA-2006/50 peak x 4 channels). high- and low-pass filters. Separated Variable Color display. Plugs into ALL (LARGE) 16PIN JVC Stereos / DVD Players / Indash Units. 16 PIN Wire Harness to Plug into JVC STEREOS. JVC PLUG IN THE PICTURE. Use when installing an JVC stereo into car without cutting wires! THIS IS THE ORIGINAL WIRE HARNESS FOR THE FOLLOWING MODELS. • Power cord includes the following color wires • For more detail read the installation manual. Green, 10. Green w/black stripe, 11. Purple, 12. Harness has 4 pairs of speaker wires, and power wires for Battery, ACC, Ground, Power Antenna, Amp remote, Illumination, Mute, and Parking brake wire. This list is of known units this harness will work with. THIS IS ONE RADIO PLUG FOR JVC, EXAD, ARSENAL. jvc makes 3 pluh as of 12-12-18 a old one line whit one and to black ones a big one and this small one. PLUG COLOR - BLACK. PIN - 16-PIN. I AM NOT PERFECT I TRY TO GET EVERY ORDER RIGHT BUT MISTAKES DO HAPPEN SO IF YOU GET THE WRONG ITEM. JVC Touchscreen Car Radio DVD CD MP3 AUX Bluetooth Receiver. For Android OS 4.1 and above devices, you can download JVC Music Play App. Built-in Bluetooth technology for hands-free talking and audio streaming. JVC Touchscreen DVD CD MP3 AUX Spotify Sirius Bluetooth Receiver. Listen to Pandora, iHeartRadio, and Spotify from your smartphone on the headunit via USB or Bluetooth. Wiring harness is compatible with JBL or amplified sound systems. 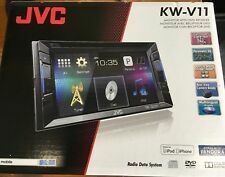 JVC Touchscreen Car Radio DVD MP3 AUX Bluetooth Receiver. Wire Harness Retains Onstar, Bose and Non-Amplified Systems. Compatible with or without Bose systems. Retains factory premium BOSE audio (Y91 digital. ). For Android OS 4.1 and above devices, you can download JVC Music Play App. >Built-in Bluetooth technology for hands-free talking and audio streaming. Compatible with 2006-2012 Toyota RAV4. Double DIN Installation Dash kit with harness. JVC KW-R800BT CAR CD RECEIVER With 2 BOSS CHAOS CH6950 600W. LIKE NEW IN OPEN BOX. (No scratch,dents). Standard cable for connecting Auxiliary devices to certain JVC stereos. This is a 16 pin type typically used on older units.